In the large work bowl of a mixer, cream together the butter, peanut butter, and both sugars until smooth. Add eggs, one at a time, making sure each is fully mixed in. In a medium bowl, stir together the flour, baking powder, salt, and baking soda. Slowly stir in flour mixture, 1/3 at a time until completely incorporated. Refrigerate dough for 1 hour. 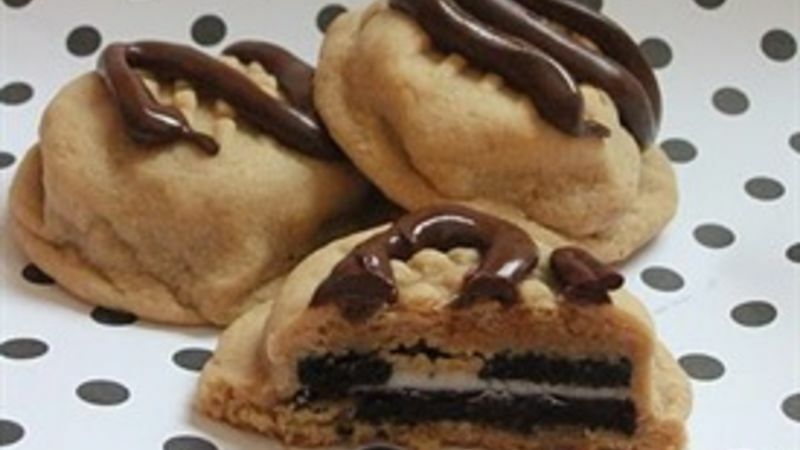 Place 1 tablespoon of cooking dough on top of an Oreos™cookie. Place a second tablespoon underneath. Gently press the dough down around the Oreos™, sealing the cookie dough edges together so that no Oreos™ shows through. Transfer the cookie to a prepared baking sheet and repeat, leaving about 1 1/2 inches between each cookie. Bake for 10-12 minutes, or until cookies have just started to brown around the edges. Cool on baking sheet for 5 minutes, then transfer to a cooling rack.